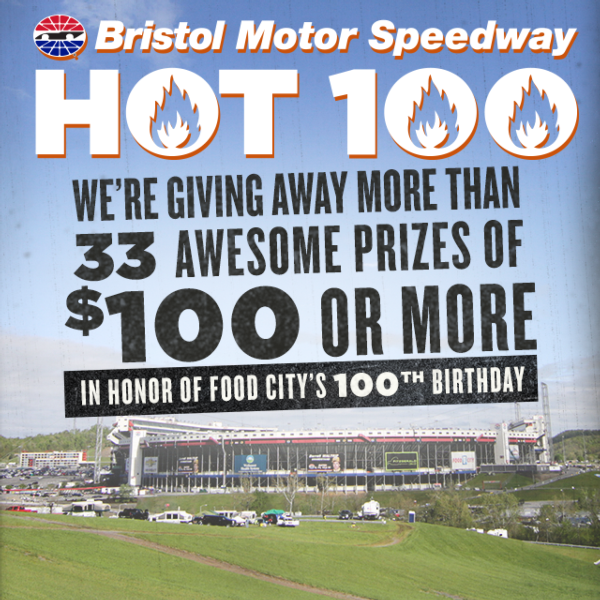 Celebrate Food City and Chevy's 100th Birthdays with "Bristol's Hot 100!" 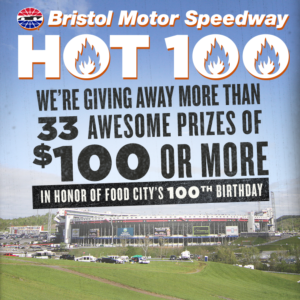 Beginning today, fans can enter for a chance to win cool prizes in Bristol Motor Speedway's new promotion: "Bristol's Hot 100!" Fans are able to register until 11:59 p.m. on Sunday, Mar. 25. Only one entry is allowed per person. All 34 winners will be drawn on Monday, Mar. 27. Each winner will have 48 hours to claim their prize and all prizes will be mailed out by Saturday, Mar. 31. Bristol Motor Speedway would like to thank the following partners for participating: Food City, Try It Tiny, First Tennessee Bank, Buck Baker's Seat Time Racing School, Bass Pro Shops, Ole Smokey Moonshine, Durango Boots, Coleman Coolers, Busch Beer, O'Reilly Auto Parts, Pinty's Chicken, Meade Tractor, and Ruby Falls. And for families who want to bring the entire clan, Bristol Motor Speedway officials are making it easier than ever for kids to have an awesome experience. Kids' tickets (12 and under) are free and adult tickets are $5 for Friday's (April 13) Bush's Beans Pole Day. On Saturday (April 14), kids' tickets are free and adult tickets start at $30 for the Fitzgerald 300 NASCAR XFINITY Series race and the Zombie Auto 150 NASCAR K&N Series doubleheader event. On Sunday (April 15) adult tickets start at $60 until April 1 for the Food City 500 and kids' tickets are $10. For all races, each child must have a physical ticket in hand to enter the gates. The Bristol Motor Speedway ticket office is the only authorized location that can produce the free kids' tickets. To purchase tickets to the Food City 500, please call 423-BRISTOL or buy them online at www.BRISTOLTIX.com. Adult Tickets can also be purchased directly from any neighborhood Food City store for $50.